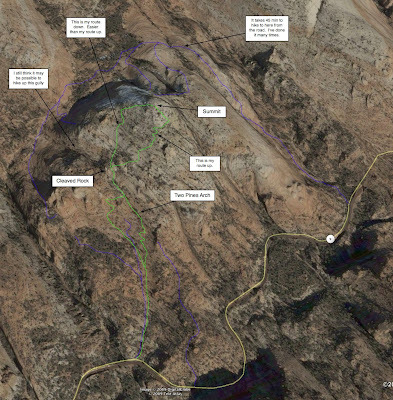 For the benefit of anyone wanting to hike Progeny Peak, here's a map showing my routes up and down (green). I've also indicated all the other approaches I've tried (blue). Here are a few photos I took along the way. 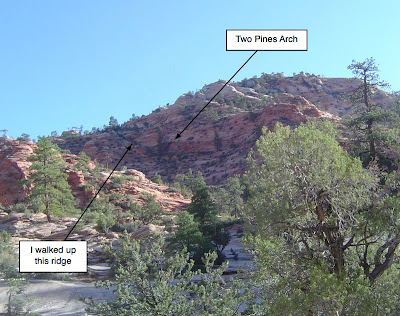 I'd seen photos online of an arch on the SW face of the hill called "Two Pines Arch", so I first headed for that. It's a nice waypoint because it's easy to see from below. Once you're barely off the road, you should be able to see the arch. 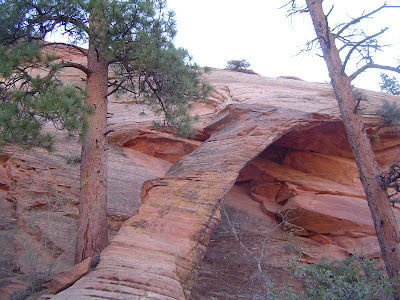 From the arch, I walked up the small ridge to the left and continued in the same direction, following a seam of light colored rock. 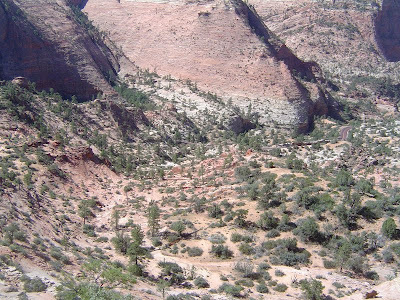 Here's a shot looking back down that ridge toward the arch. Here's what it looks like looking to the right toward the road. 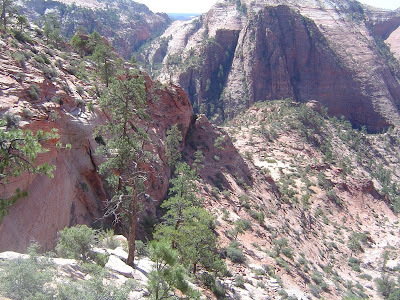 Here's the view a little further up that ridge to the left of the arch. 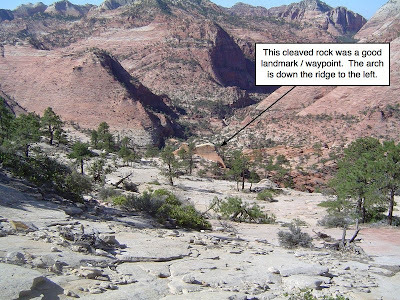 When I made it to the big cleaved sandstone, I turned right and headed up the hill. I foolishly followed some rock cairns I saw that led me toward the right (south) side of the summit rise. It's easier if you head for the left (northwest) side - that's the way I came down. Some of the hill was a little steep, so I did some traversing to make it easier. On the way down, I could easily see (and aim for) the cleaved rock. It was a great waypoint. 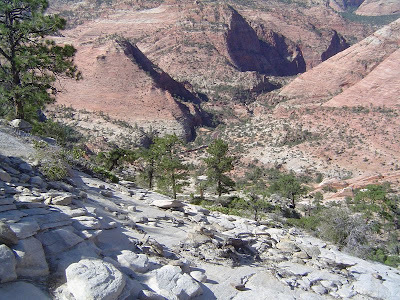 Some of this section was kind of steep and the surface rocks are unstable. That gets your attention for a short distance. 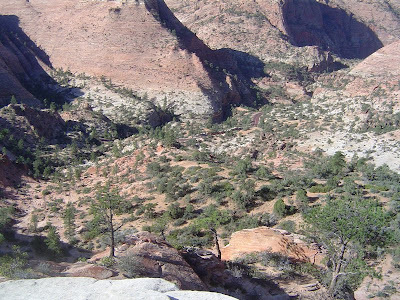 I walked down to the place above the arch, then traversed to the northwest where I had this view before heading down into the drainage gully and on to the road. I posted a short video taken by the camera attached to my backpack shoulder strap. It's about 10 MB in size and covers the very last part as I made the summit from the south face. That file is named "Progeny Peak Summit.mp4". I also posted a short video I took from the summit. It's about 7.1 MB in size and formatted for my iPhone. The original is 71 MB with a much larger frame size. I took it with my Kodak Zi6 video camera. It's a great little camera, but lacks image stabilization. Its replacement model (Zi8) has that, so I may buy one of those. The file is named "Progeny Summit View.mp4". Both videos are posted here to my Google Sites page. It took me 1 hour 10 minutes to reach the top and less to return to the car. Now that I know the terrain better, and know some waypoints, it would take me less time. I recommend this hike. But please do NOT carve your initials into the sandstone at the summit like some bozo did. That's totally wrong. 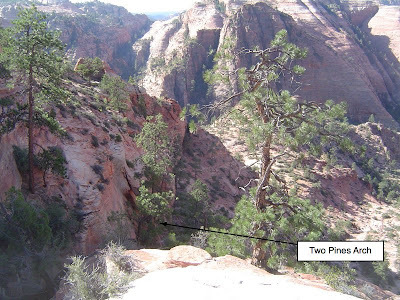 I forgot to mention: here's the site where I read about Two Pines Arch and the hill's name (Progeny Peak). My route up is close to that shown on their topo map.